What a difference a decade can make. Ten years ago, if you’d asked the average Joe or Josephine who Deadpool was, they had either mumbled something about a Dirty Harry film or started at you blankly and replied “Who?” But thanks to the sheer persistence of the books’ many creators (who over time have pushed the envelope further and further in terms of content, excitement and the sheer lunacy of some of ‘Pools story-arcs), the devotion of the numerous global cosplayers who have assumed his identity, plus an ever increasing readership and the persistence of a certain Mr Ryan Reynolds, Deadpool – aka Wade Wilson – aka the Merc with a mouth – is a now a household name. 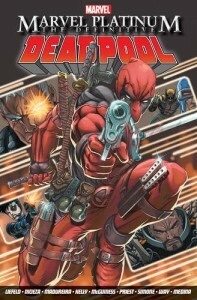 And with the imminent arrival of Wade’s first solo foray into the moving image, the good folks at Marvel and Panini decided it was about time that his expanding fan base were brought up to speed, and date, with Deadpool’s wonderfully insane history.